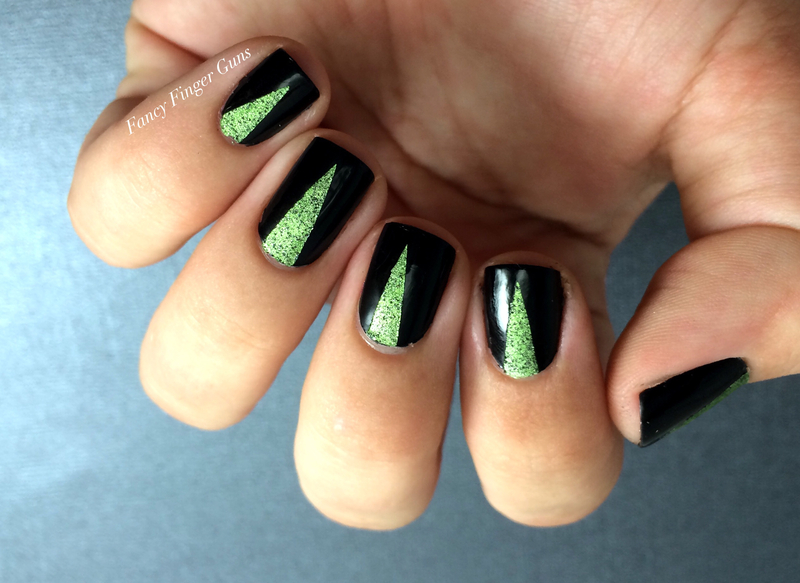 Halloween mani #6: Pointy & Chic! I used a basic glossy black, Sinful Colors’ Black on Black (which is goopy and weird even though I just bought it; I should really scoop up China Glaze’s Liquid Leather), then when the top coat had fully dried, I used washi tape to create sharp, skinny points on each nail. For the points themselves, I used China Glaze’s But Of Corpse, one of their textured polishes from last Halloween’s collection. I loooove this polish! Not only is the name obviously amazing, but the texture is very subtle – so subtle that it was difficult to capture on camera, in fact – but I liked that it was just a little something extra. Tried my best to show the texture of But Of Corpse. 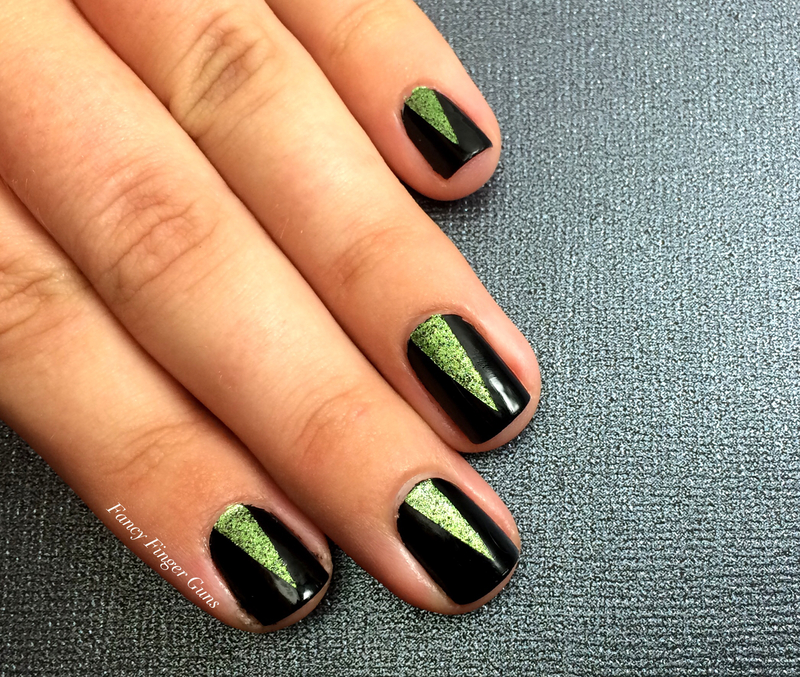 I really loved the edgy vibe this color gave the mani – it’s a medium, slightly washed out green (very Frankenstein’s monster!) with speckles of black, which looks cool and creepy enough on its own, but along with the sharp black it looks very spookily chic, indeed! 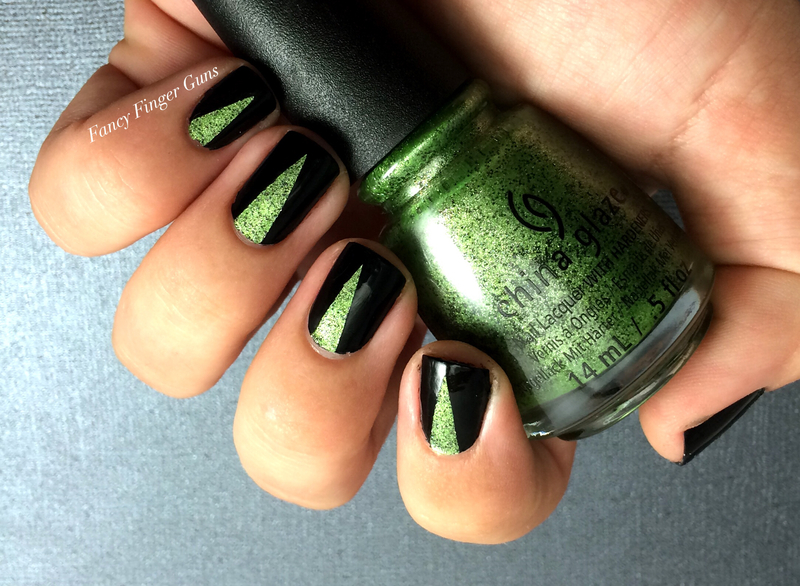 I imagine a chic Disney villain like Maleficient would rock the hell out of this mani! Forgot to include butter LONDON’s Cotton Buds, my white base. 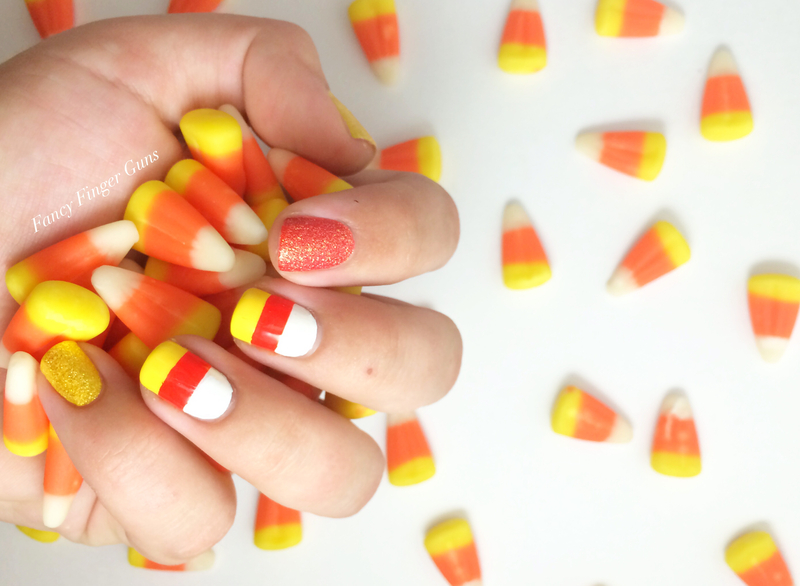 I used this tutorial from @nailsbycambria because the last time I did candy corn nails, a few years ago, it was a total mess – my lines weren’t crisp, my polish looked chunky from to many layers, ugh. This was much easier, although it still took a little maneuvering to get each stripe of color the same size. I decided to use a brighter orange because it was more fun, but after applying all my polishes I realized that unfortunately Jinx is more coral than orange like I’d thought, so it bothers me a little that the colors aren’t closer, but whatevs. Oh man, I really love my Zoya texture polishes – I do get a little tip wear, but otherwise, those suckers don’t budge for days! Even my white base of butter LONDON’s Cotton Buds didn’t immediately chip, which is something of a miracle. 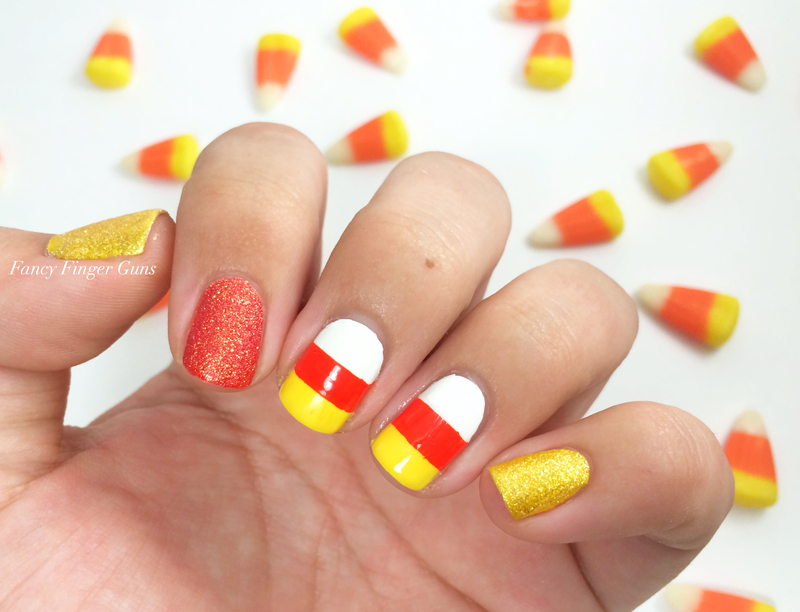 This mani was so fun – I got a lot of delighted compliments on it (I guess people really love candy corn?) and I kinda wanted to keep it on for longer but with 13 manicures to get through this month, I really need to hustle through them all. Sorry about that little nick on my middle finger – I keep forgetting to cover it up in my pics! Hi everyone! How’s your week starting off? I’m trying to post more this month, so today I’ve got a simple mani I did a few weeks ago. I forgot to take a polish bottle pic, oops! I don’t think I’ve ever used this color combo before, but I really like it! 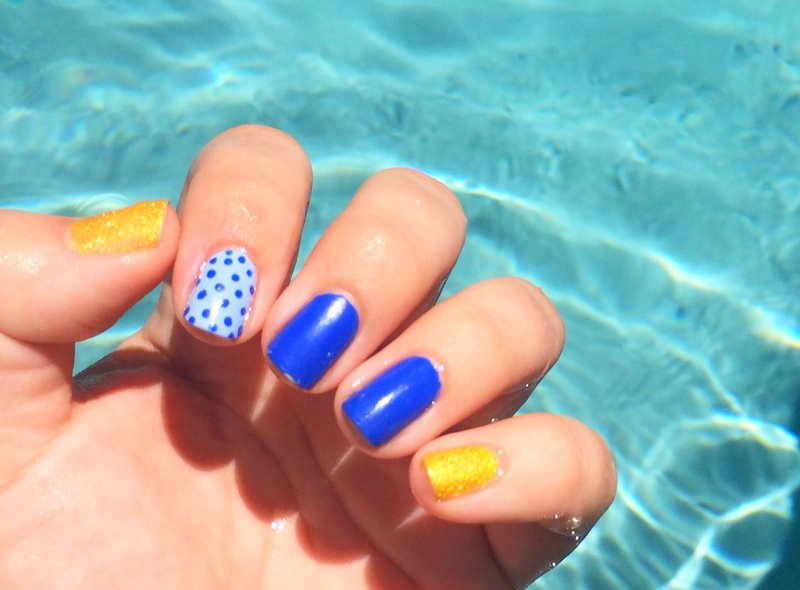 Yellow and blue reminds me of French provincial style and that can be a little cutesy (sometimes almost verging on shabby chic, which I am not a fan of), so I didn’t want to do anything to frou frou and kept it simple with a dash of sparkle and a pop of polka dots. 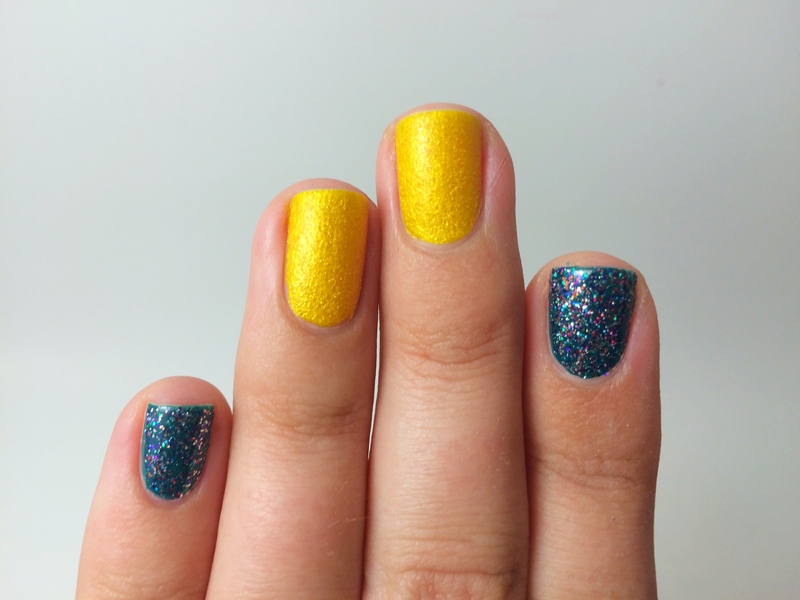 The yellow is Nicole By OPI’s Lemon Lolly, and it’s basically the same as the OPI’s mini You’re So Flippy Floppy except it’s a normal-sized bottle and it’s super sparkly. Yasssssssss! 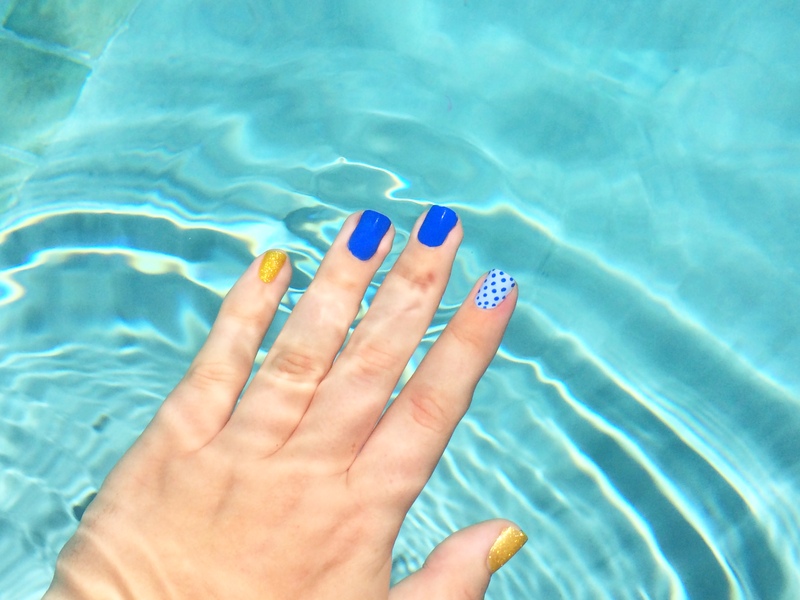 (I love me a yellow texture polish – this is now my third one!) 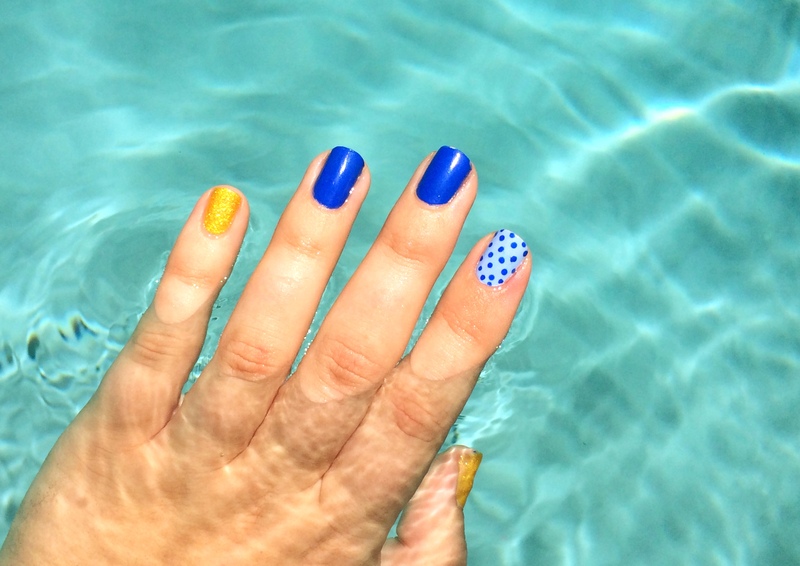 The royal blue is everyone’s favorite, Nails Inc’s Baker Street, and the light blue is Essie’s Bikini So Teeny, which I’m having a love affair with right now despite its less-than-stella formula. I couldn’t really get a good pic of how sparkly Lemon Lolly is, but trust, it’s gorgeous. If you like yellow and/or texture polishes, I got it a few weeks ago at Marshall’s, so it’s worth going by your local store to see if they have one you can scoop up. 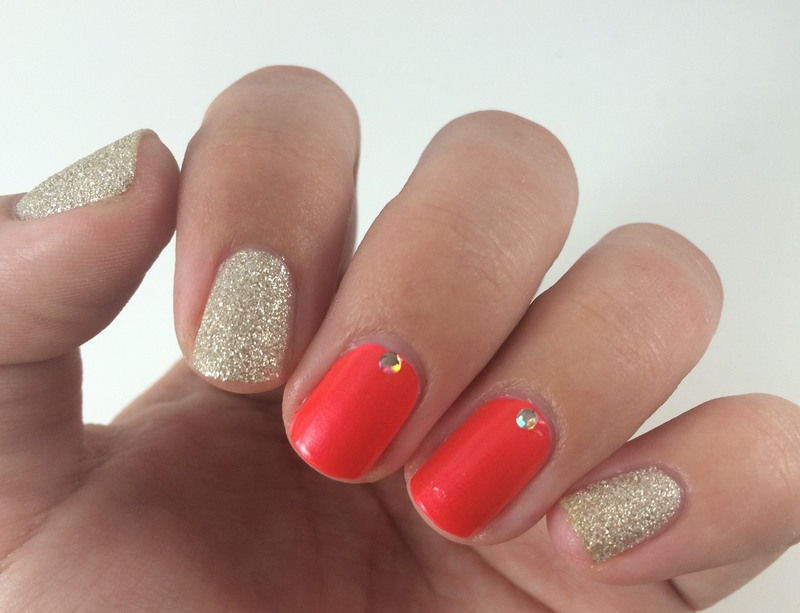 Overall, though, this was such a cute and easy mani, even if Baker Street chipped on me almost immediately. 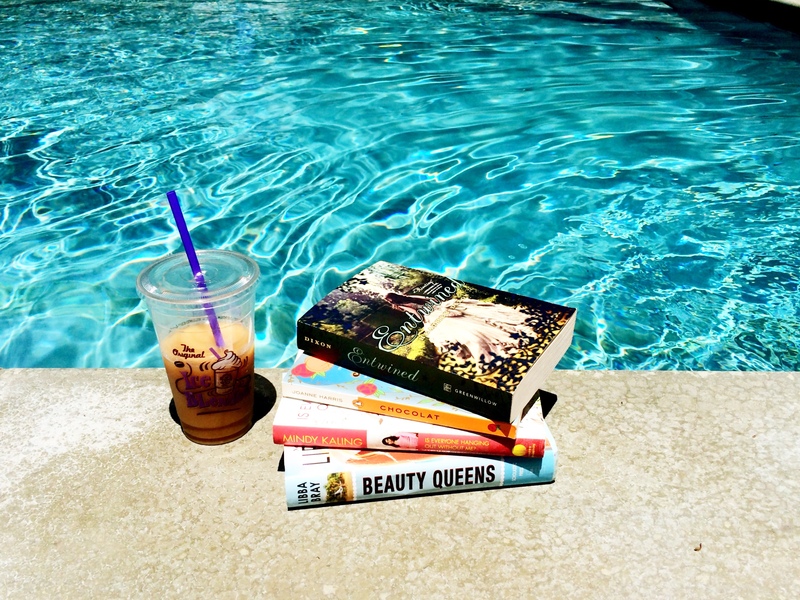 Perfect for a lazy Saturday in the pool, anyway! Hi everyone! 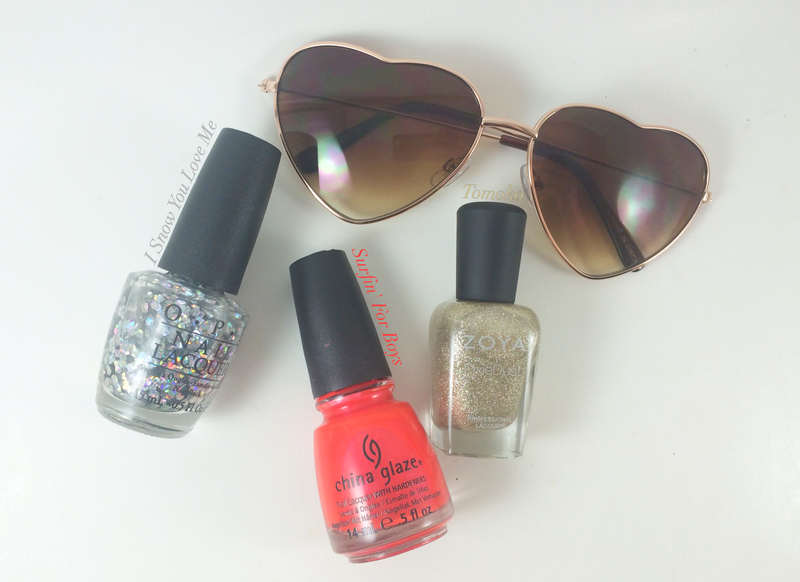 Today I have some gorgeous new (to me) polishes to show you! So back in 2009 when I was first really getting into the lacquerhead game, OPI released a holiday collection based on the Tim Burton Alice in Wonderland. I saw pics on my fav nail blog, All Lacquered Up, but just sort of skimmed because it seemed like the usual boring “ten kinds of reds” collection. There was a pretty glitter I liked, but at that point I still thought $8 for a nail polish was pricey (ha!). Later, of course, that glitter, Mad As A Hatter (MAAH), would become one of the most sought-after, hard-to-find polishes that many a nail fiend would go crazy over. I remember trying to find a good enough dupe in the years that followed, but nothing really matched it and I wasn’t about to pay $100 on eBay for a bottle. However, about three weeks ago I got an email from Ninja Polish, saying they were having a 40% off sale. 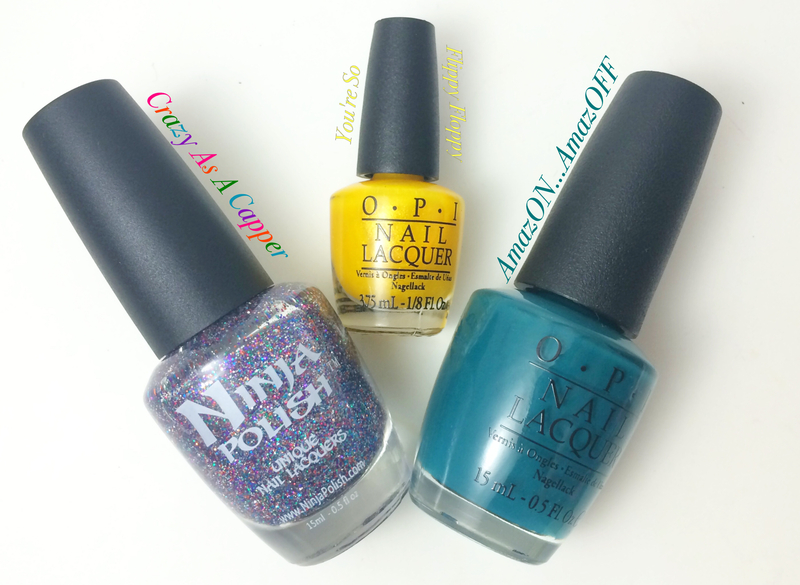 Ninja Polish carries brands that are difficult to find in the U.S. like Models Own as well as their own brand and indies, like Cover Band, which made dupes of htf cult favorites, like OPI’s legendary Glamour and MAAH. They still had both those two in stock, which I snatched up within minutes. 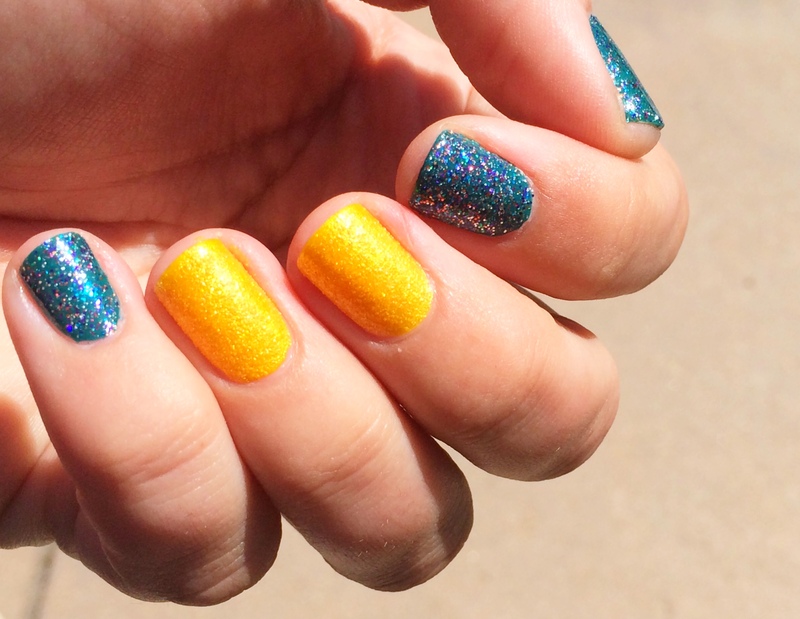 I paired CAAC with OPI’s AmazON…AmazOff (ughhhh these names are killing me) from the recent Brazil collection, and You’re So Flippy Floppy from their mini Liquid Sand collection. I reeeally wish OPI had made these minis full size – they are so great, and way more interesting than most of the polishes in their recent collections! (I particularly loved I’m Brazil Nuts Over You, which was basically a textured version of my fav, China Glaze’s neon coral Surfin’ For Boys.) 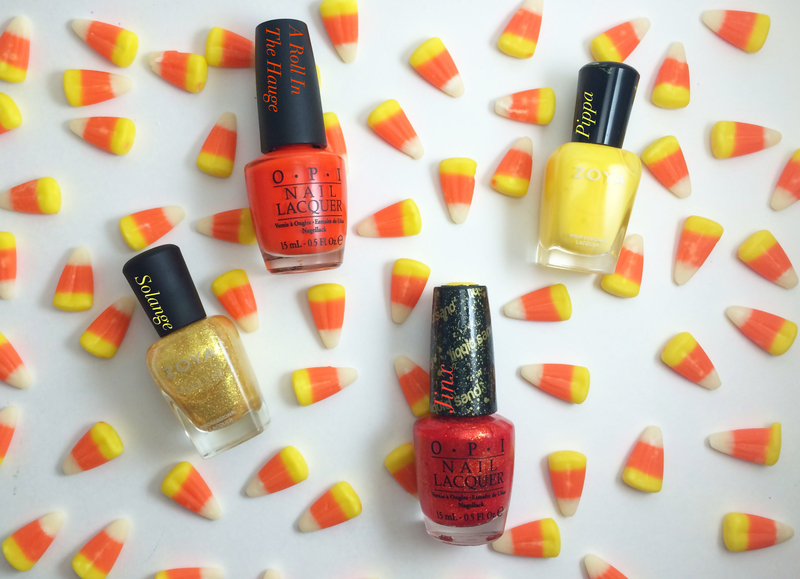 I think I only used one coat of AmazON…AmazOFF – if there were any streaks, the glitter covered it up. And what a fantastic glitter it is! 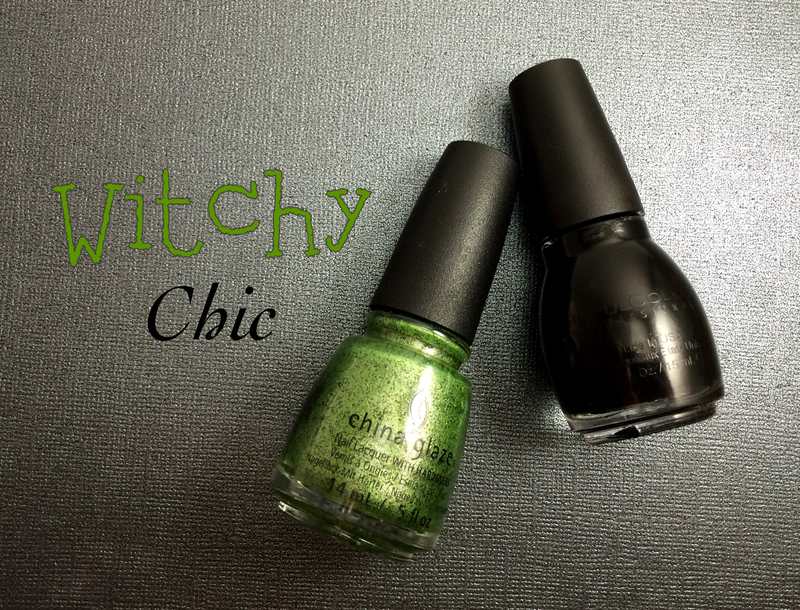 I’m so glad I signed up for the Ninja Polish newsletter, y’all – CAAC is disgustingly gorgeous. It’s a combination of fine pink, purple, blue, copper, green, and silver glitter and this is only one coat! It’s super sparkly and gave perfectly even coverage of glitter with one easy swipe, plus the size of the glitter meant I only needed one layer of top coat for a smooth finish. I mean…swoon. Hi everyone! This past weekend I went to San Francisco – and of course, being me, figuring out a manicure to wear is almost as important as planning outfits. I wanted to use one of my new Zoya PixieDusts because they wear really well and I’d be in SF for almost 4 days, but just wearing one color seemed a little too boring, so I added one of my favorite colors and used another for a fun accent. I showed I Snow You Love Me about a year and a half ago on this site (and I won’t be linking to it because it was when I just started and those pics was BAD, y’all) but haven’t touched it since then. 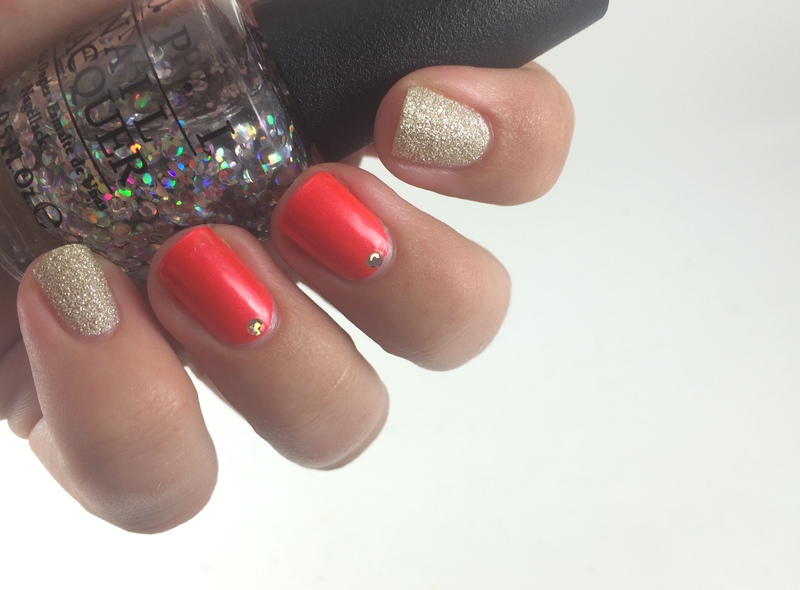 I like the idea of this polish – especially since OPI isn’t a super innovative brand – but you can’t just slap it on because of the thick base coat and how the glitter pieces sink to the bottom. I decided to scoop out a few to position at my cuticles for a punchy holo accent and I really love how it looks, especially over the neon of Surfin’ For Boys, one of my all-time favorite polishes. My skin tone’s a little weird in those pics because I was trying to capture the neon tone of Surfin’ For Boys. Sorry also for how generally busted my nails look – I haven’t been able to take care of them much recently. Usually PixieDusts last very well on me, but of course the time I really needed it to, Tomoko chipped the second day. And kept chipping. And kept chipping until I had a tiny patch left in the center of my nail. Boooooo. Oh well, this was pretty while it lasted! I’ve lived in Los Angeles for about 6 years now (Jesus) and I’ve always wanted to go to San Francisco, but I could never get anyone to go with me – everyone I know has already been there, either with their families or boyfriends/girlfriends, and weirdly didn’t want to go again (despite raving about how it’s the best city evaaaa, etc). The good thing about living with my sister is that I have a built-in travel buddy, and in January when we realized Presidents’ Day meant a Monday off, we decided to look up flights. 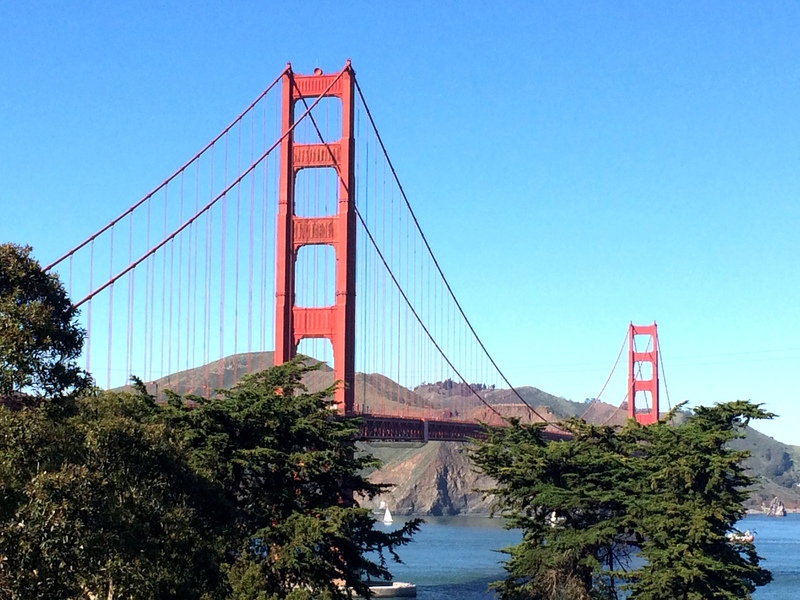 Since February isn’t exactly high travel season, we managed to score plane tickets and a hotel near lots of cool SF things for pretty cheap – victory! 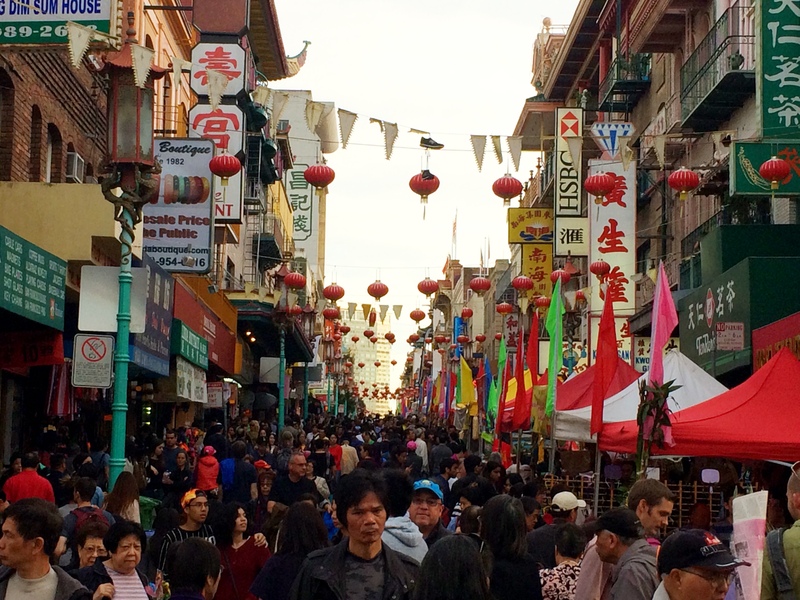 Unfortunately, everyone else in Bay Area had the same idea to go to SF, and the city was insanely crowded all weekend. It also was much warmer than it normally is, which was great for the locals – who wouldn’t stop giddily remarking on the weather – but annoying for me, queen of complaining about hot weather. (To be fair, it wasn’t HOT hot, but when you’re walking around in the sun all day, it does get uncomfortable.) I’d been looking forward to chilly temps and cloudy skies, so I was a bit grumpy I’d brought jackets and scarves for nothing. Sigh. Our first full day there, we took a tour we found on Groupon, the San Francisco Love Tour. You get driven around in an old VW bus painted psychedelic rainbow with an electric blue interior, which is obviously awesome, and the tour guide Alan, was even more awesome. He’s had a really interesting life, was super knowledgeable about the city, and just a really cool, friendly guy – as we drove around, people driving alongside us or on the sidewalks were gawping at the crazy car and he’d wave out the window and shout greetings at everyone. When traffic made it seem like we wouldn’t get to see half our tour, he mentioned there was no tour after us and that if we were game, he’d make sure we saw everything. We all said yes, and not only did we hit every area on the list, but we even made a detour and got to take photos in front of the Golden Gate Bridge which he doesn’t normally do. 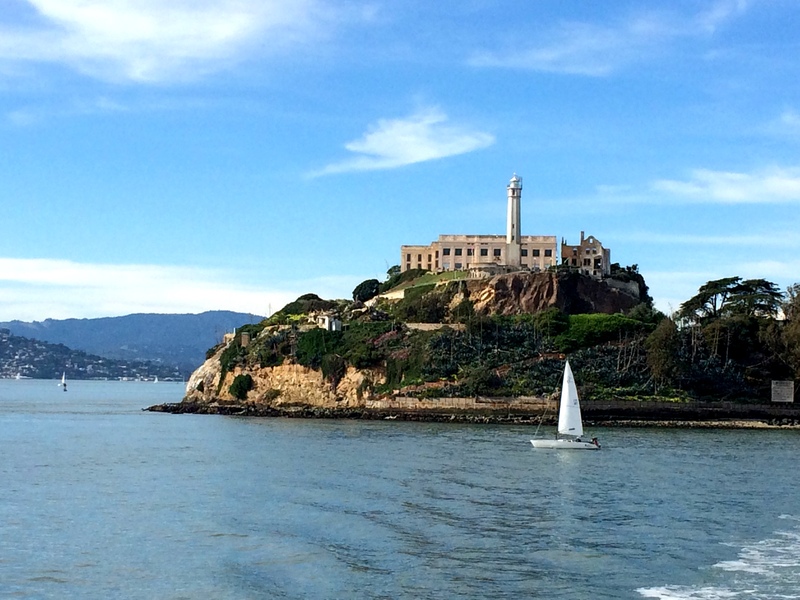 If you’re looking for a tour of San Francisco, definitely check this one out, you won’t be disappointed! 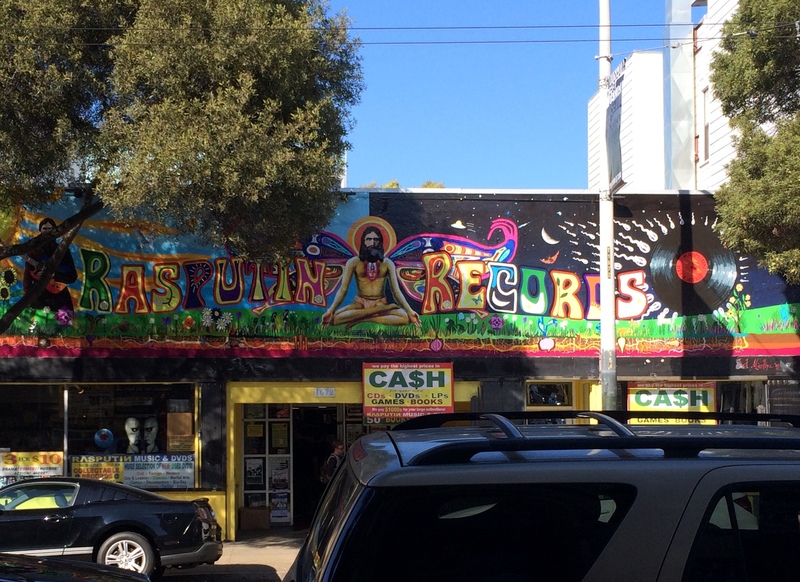 Caught some of Alan, the tour guide – yes, he wore a tie-dye hoodie that matched the van. I’m not sure if it was the weather or the amount of people or what, but I was a little meh about San Francisco. I think because literally everyone I know who’s been RAVED about how much they loved it, would move there if they could, etc, that I felt like I was a…weirdo or something? for not loving the city. We did all the things you’re supposed to do, but I didn’t feel that connection to the city. 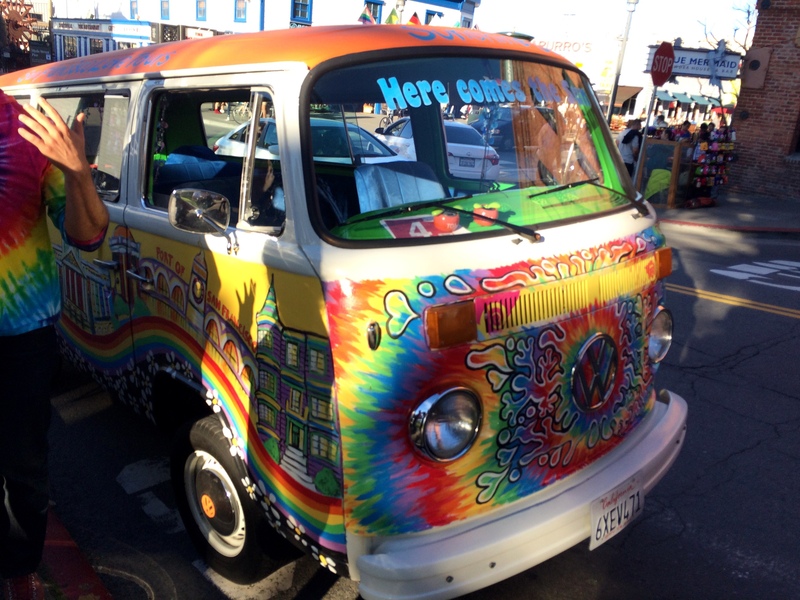 The only thing I really loved was wandering the Haight-Ashbury district – my sister and I had an amazing lunch at a great noodle joint (The Citrus Club) and the shops were really cool and fun, and of course we had a scoop of ice cream at Ben & Jerry’s. It was a really cool area and I snapped up some cute clothes that I can’t wait to wear.